Like many others, I think cat accessories almost invariably look dreadful, with much brown carpet and awful shapes. So I was trying to find a nice looking solution. I found this good idea online but..hello, $604?! Besides I’m in London, UK and my furniture is gloss white in the dining area where I wanted to put the scratch post/snug. EXPEDIT was just the ideal solution! If you want something bigger, LACKcan do also, minus the castors unless they lock. I put the LACK together, then got the sisal rope (20 mt, from Homebase), fixed it to the cube with a U-shaped nail, then wrapped it VERY tight around the side, put another nail at the end, and two more nails at the top and bottom on the ‘scratch side’ so the ropes don’ slide up and down when the cats go at it with gusto (they’re two big boys!). I put some adhesive Velcro to keep the cube in place onto the floor, but so I can also move it around to clean etc. Then I put two small cushions I had already, fixing the top one to the shelf with some Velcro so it does not fall off. Sadly, I cannot find this single cube anymore at IKEA 🙁 anyone else have any luck with this? I looked all over the store and website and cannot find it. Lovely little hack, Laura! Thanks for sharing. I don’t know about putting anything adhesive on the hardwood floor. Costs a fortune to refinish. And your cats too. 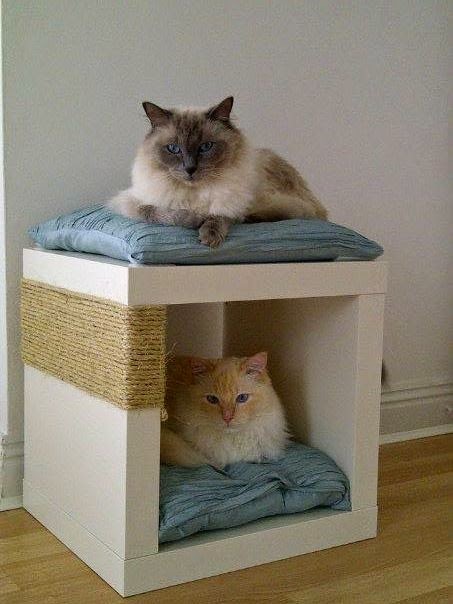 I think I’ll build something similar for my 3 cats so they leave my sofa and chairs in peace. It really looks great for a modern flat. NIce , Top cat looks like a Ragdoll? I have one that looks like him..LOve them. Great idea! I also had an Expedit single cube left and copied your hack for my cats. The only thing I will need to change is the cushion on the top, mine is quite fluffy and my cats prefer something in the style of window sill cushions (rather flat), but apart from that they love it. Tip: I put some catnip in the bottom cushion.